The following article appeared in the Oxford Mail following Aleida’s visit to Oxford as part of the ‘Remembering Che’ tour. Aleida Guevara, the eldest daughter of the iconic Argentinian revolutionary, visited Oxford yesterday on the last stop of her Remembering Che tour. As well as signing books and taking a whistlestop tour of Oxford, she used the trip to raise awareness of the situation in Cuba, which has been under blockade by the United States for 50 years. In an exclusive interview with the Oxford Mail, she said: “The main purpose is to speak about the Cuban reality today, the struggle we wage in Cuba against the American blockade. She spoke about her father, who was executed in Bolivia when she was seven years old, with great admiration, and said she had seen a massive demonstration of respect for him and his beliefs in Britain. 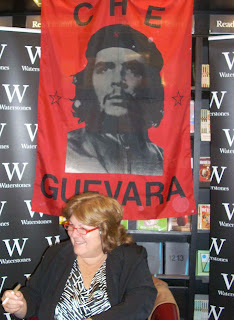 Fans of Dr Guevara and her family packed the Waterstones store in Broad Street to have copies of her mother’s book Remembering Che and other texts signed. Hundreds of activists, trade unionists and campaigners lay siege to the US Embassy in London yesterday to protest against the ongoing unjust treatment of the Miami Five by the United States. The Cuba Solidarity Campaign’s annual Vigil for the Miami Five has become an integral part of the British campaign in support of the Five and, this year, fell a week after the 14th anniversary of their arrest. The sixth annual vigil for the Miami Five welcomed speakers from across the trade union and labour movement, enjoyed performances from actors and musicians and heard from Aleida Guevara, daughter of iconic Argentine revolutionary Ernesto ‘Che’ Guevara. 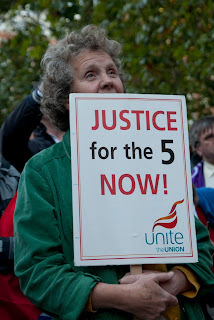 The trade union movement has been fundamental in growing the campaign to Free the Five. As usual, this support was visible on the night as trade union flags and banners were festooned throughout the audience and the platform boasted speakers from a number of the 24 national unions affiliated to CSC. These included Frances O’Grady (TUC), Len McCluskey (Unite), Eric Roberts (Unison), Christine Blower (NUT), Billy Hayes (CWU), Manuel Cortes (TSSA), Jonathan Ledger (Napo) and Carolyn Simpson (SERTUC). 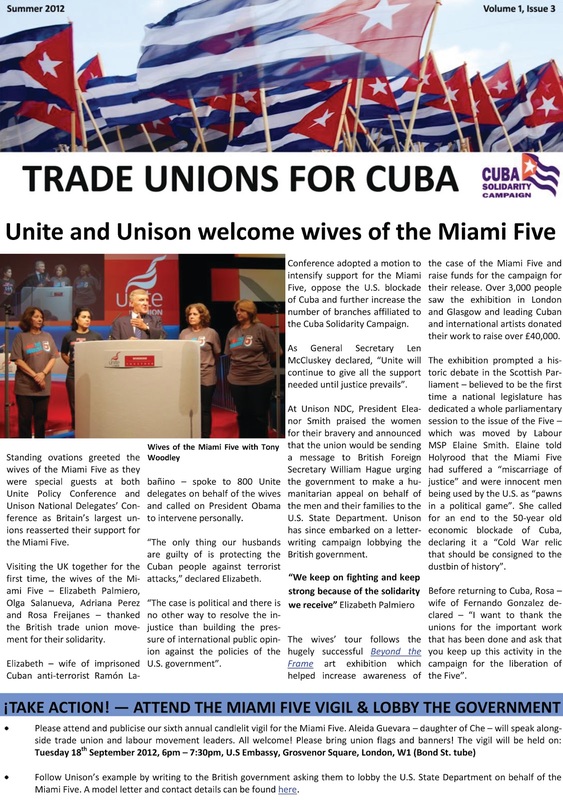 All agreed that – whilst it was sad to continue the struggle for justice – their unions would continue to do all they could in support of the Miami Five and their estranged families. New TUC General Secretary Frances O’Grady “brought the support of the whole TUC” and declared “we want immediate and unconditional release now”. 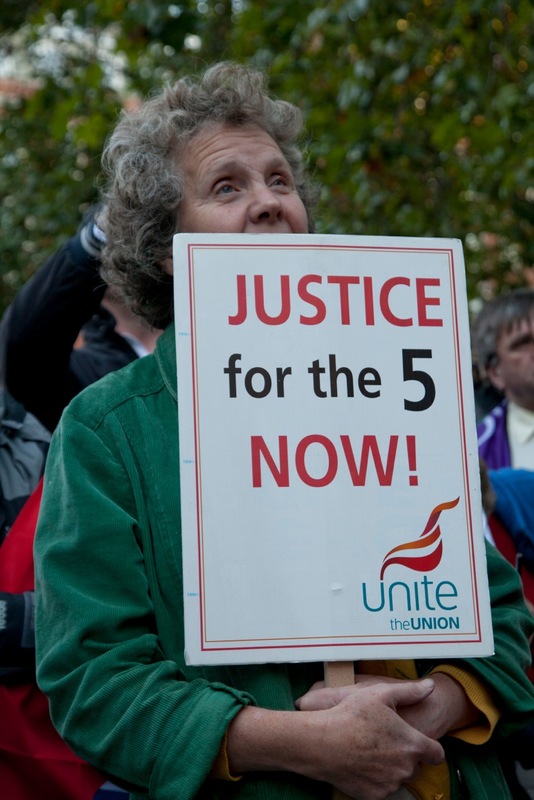 Frances was, “delighted that the first rally I’m speaking at as General Secretary of the TUC is in support of the Miami Five”. She highlighted the irony that the Miami Five remain imprisoned for defending Cuba against terrorism in a country famous for inventing the “so-called War on Terror”. As she remarked, the hypocrisy of the US “knows no bounds”. 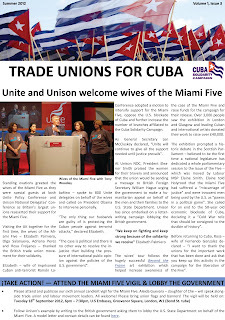 One of the biggest champions of the Miami Five in recent years has been Unite the Union and – in the last year – they have welcomed the mothers of the Five and the wives of the Five to their Sector and National Policy Conferences. General Secretary Len McCluskey sent a clear message to the American Embassy – and the US government – that they “are not just dealing with 11m Cubans, they are dealing with the whole of the working class movement throughout the world. We will not allow you to bully and intimidate our Cuban comrades”. He placed the persecution of the Miami Five within a history of aggressive US policy towards Cuba and emphasised, in particular, the ongoing blockade. Cathy Jamieson MP made an important contribution as she urged the assembled crowd to lobby their MP to sign EDM 497. The EDM was tabled by Michael Connarty MP and calls for visitation rights to be granted to Olga and Adriana – wives of Gerardo Hernandez and Rene Gonzalez – who have been unable to see their husbands for 14 years. In little over a week, the EDM has accrued nearly 30 signatures from parliamentarians representing eight different parties. Progressive legal firms have been crucial in the ongoing legal struggle in support of the Five. Doug Christie and Steve Cottingham spoke on behalf of two firms – Thompsons and O.H. Parsons respectively – that have led the field in the UK. Doug and Steve gave an update on the legal situation – including reference to recent revelations that the U.S government paid journalists at the time of the trial to write prejudicial articles – and contextualised the treatment of the Five within a history of state collusion and conspiracy. Moving musical accompaniment was provided by Omar Puente and Rebecca Thorn with a wonderful rendition of Hasta Victoria – which got the audience singing along – whilst actors Adjoa Andoh and Andy de la Tour performed an emotive reading of letters exchanged between Rosa Aurora Freijanes and her imprisoned husband Fernando Gonzalez. As darkness descended and candles flickered in the wind, Aleida Guevara entered the stage to rapturous applause. Aleida echoed previous contributions that we struggle, not just for the Five, but for their brave mothers, wives, children and families. She lamented that their trial and incarceration “violates the legal norms of the United States”. Aleida Guevara visited Scotland as part of her ‘Remembering Che’ tour. Her visit began with a short protest outside the Scottish Parliament on the Miami Five, coinciding with the 14th anniversary of their arrest. Addressed by Aleida, MSPs, Elaine Smith, Sandra White, Neil Findlay, Jamie Hepburn, and STUC Deputy General Secretary, Dave Moxham, it called for an end to the silence around the case, and for their immediate release. This was the first activity on the Miami Five at the Scottish Parliament, following May's historic debate on the case of the Five, around Elaine Smith's motion. 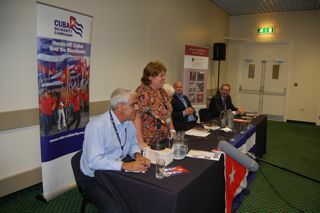 Later the Cross Party Group on Cuba met, and was addressed by both Aleida Guevara, and Luis Marron. A packed meeting heard Aleida speak movingly, not only of her father and mother, but of her own solidarity work as a doctor in Latin America, and what she had learned from it. Referring to the Miami Five as her brothers, she reiterated the call for their freedom, and insisted that all that was required was for the USA to follow their own laws. Elaine Smith, MSP Deputy Presiding Officer of the Parliament and Convener of the Group, who had lodged a motion welcoming Aleida's visit to the Parliament closed the meeting, promising that supporters of Cuba in Scotland would continue to redouble our efforts to bring and end to the illegal Blockade, and win Freedom for the Five. The following article appeared in the Daily Mirror. To some he’s a cold-blooded executioner. To millions, he’s the revolutionary whose face has come to symbolise their own struggles against oppression. And to others, he’s just an image – the epitome of cool, exploited by brandmakers and fashionistas alike. But for one woman, Ernesto “Che” Guevara was simply “Papi” – a beloved father whose dedication to the South American revolution stole him from her far too soon. 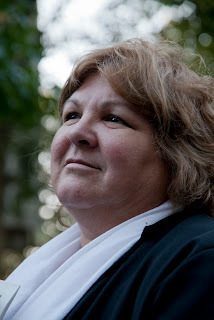 Dr Aleida Guevara, the eldest of Che’s four children with his second wife, was nearly seven when her dad was assassinated by CIA-backed agents in Bolivia 45 years ago. Growing up in his shadow, the widespread adulation for him confused her at first. Aleida, now 51, is speaking in Brighton ahead of a talk she was giving at a fringe meeting at the TUC conference. Named after her mother, she bears a strong resemblance to her father, with warm eyes, ready smile and fierce passion evident in her hand gestures. A series of motorcycle tours through impoverished parts of South America in the early 1950s – since made into films based on his diaries – fuelled Argentinian-born Che’s opposition to inequality. He rose to prominence with Fidel Castro in the successful guerilla campaign to overthrow Cuban dictator Fulgencio Batista in the late 50s. But Che left Cuba when Aleida was just four to continue his mission to spread revolution in Latin America and beyond. He was killed almost three years later in October 1967, deep in the Bolivian jungle, aged just 39. Che kept diaries and wrote poignant letters to his family, which he used to maintain his role as a father in a way he couldn’t physically. He made up stories to keep them in check. When Aleida’s younger brother Camilo got in trouble for swearing at school, Che wrote to him saying he must stop otherwise Pepe the Caiman – a character he invented - “would bite off” Che’s leg. Che disappeared from Cuba after upsetting the Soviets who backed Castro, but occasionally he would sneak back to visit his family, disguised so his children wouldn’t recognise him and give the game away. It is those visits that form most of the scant memories Aleida has of her father. She smiles as she describes one favourite visit: “Beautiful because it’s all my own memory, not distorted by other people. “I was about four-and-a-half, in a dark bedroom. My mother was holding my youngest brother Ernesto, a month old. There was a man behind her in military fatigues, and I saw his huge hand stroke my brother’s head and hair so delicately, just like I remember he’d do to me. A mother herself, to daughters Estefania, 23, and Celia, 22, divorced Aleida now appreciates her father’s dilemma. Tears come to her eyes as she says: “I’m a mother now, and I understand what it means to say goodbye to a baby. I cannot imagine what went through his head about this baby my father barely knew when he left Cuba. As much as Che has been remembered for his fierce intellect and romanticism, he wrote of executing “traitors” and “spies”. These include farmer Eutimio Guerra, who admitted betraying the revolution. While she says she is not political, Aleida has dedicated herself to different causes. Part of her tour, organised by the Cuba Solidarity Campaign, UK, included a vigil in London for the Miami Five – a long-running effort to free five men the CSC say were jailed by America for infiltrating anti-Castro terrorist groups. Aleida is also a paediatrician, following in her medic father’s footsteps, to “give back all the love the Cuban people have always shown to me”, and has been instrumental in setting up children’s homes in the Cuban capital Havana. She has also worked as a doctor in other countries, particularly Angola, and like her father, her experiences bolstered her passion for equality. On her travels she often wears a T-shirt bearing the famous image of Che taken by Alberto Korda Díaz at a funeral rally in March 1960 that has become the most reproduced image in history. While often used to represent a fight against oppression, it has also been hijacked by fashionistas and used for commercial gain. Aleida says if her father’s face is used “on a poster in the house of somebody who loves him, or on T-shirts worn by young people protesting about injustice”, she feels happy. “But if his image is economically exploited, it angers me. I hate it and I’ll fight,” she said. Among others, Che’s image has been printed on a bikini, used to advertise a German optician and on a vodka bottle. It was the sudden appearance of Che’s image on posters in the streets of Havana that first alerted Aleida to his death. She says: “I asked why so many photos of my daddy, but nobody answered. 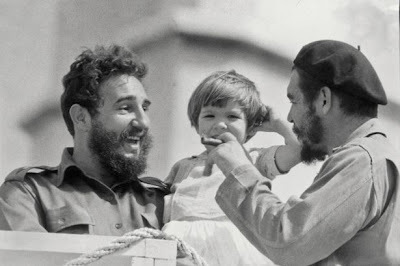 “Uncle Fidel suspected my father had been killed and wanted to prepare me and my sister for the worst. He told us he’d received a letter from our daddy, saying if he died the way he wanted to die, we shouldn’t cry for him. “The next day, I was told to take some soup to my mother. She was crying. Aleida is an outspoken critic of the US blockade of Cuba, which marks its 50th anniversary this year. She acknowledges poverty faced by Cubans and is “disappointed” in the Obama administration that she had faith in to remove it. And as Britain prepares for a TUC demonstration on October 20 against the Conservative-led coalition’s cuts on the NHS, Aleida offers her support. “Defend your rights. Don’t let anybody take what belongs to you,” she says. The following article appeared in the Nottingham Post after Aleida’s visit to Nottingham as part of her ‘Remembering Che’ tour. ABOUT 200 people turned out to see the daughter of Che Guevara speak in Nottingham city centre. 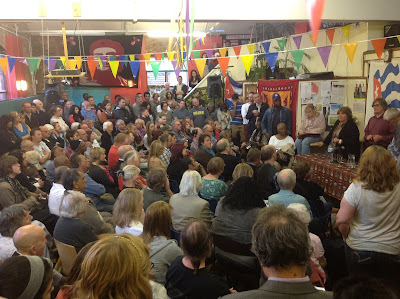 Aleida Guevara gave a lecture at the Square Centre, in Alfred Street North, on Tuesday night as part of a UK tour. Che Guevara was an Argentinian Marxist who played a key role in the 1959 Cuban revolution which overthrew the country's military government. Aleida Guevara was seven when her father was killed in Bolivia in 1967, aged 39, while trying to launch a revolution there. After his death his name and image were immortalised by many young people and used as a rallying point for left-wing politics. Ms Guevara told the audience: "I was angry, of course, growing up without a dad, but my mother always says, love your father for who he was, a man who had to do what he did. "My father died defending his ideals. Up to the last minute he was true to what he believed in. This is what I admire." 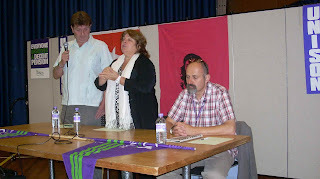 Ms Guevara also spoke at the TUC conference in Brighton on Monday, and also visited Newcastle, Glasgow and Edinburgh. Fourteen years ago today, five Cubans were unjustly imprisoned in US jails for trying to stop violent attacks against their country. The Miami Five, who were infiltrating US-based terrorist groups when seized on September 12 1998, have since won the support of human rights, legal and religious organisations - but they have received scant justice from the US legal system. And Martin Garbus - lawyer for one of the five, Gerardo Hernandez - says far more than their freedom is at stake if the latest appeal on their behalf fails. Numerous previous appeals have failed and it had seemed that their only hope was a presidential pardon. But new information, not available at the time of the trial, provides a last opportunity to take their fight for justice back to the courts. In an affidavit filed on August 31 the renowned lawyer argues that the US government's unprecendented payments to journalists during the original trial threatens not only the integrity of the case against the five, but the integrity of the US legal system itself. Sixty-six pages of evidence calls for Hernandez's conviction to be set aside - or if this is refused for the US government to at least disclose information it is withholding from the defence team and for an oral hearing. Evidence in the affidavit demonstrates that a US government agency deliberately hired and paid secret propagandists to influence the jury to convict Hernandez, who faces the harshest prison sentence of the group - double life plus 15 years - and the real prospect of never leaving prison unless his conviction is overturned. "The government's successful subversion of the Miami print, radio and television media to pursue a conviction is nearly incomprehensible. It is unprecedented," the submission states. As Cuba's National Assembly President Ricardo Alarcon pointed out recently, this would mean the US government had conspired with the media to "condemn the accused beforehand and render a fair trial impossible" - a serious violation of the US constitution. "The nature of the conspiracy was to use the media to unleash an unprecedented propaganda campaign of hatred and hostility," Alarcon says. "To this end they used a large group of 'journalists' - in fact government cover agents - who published articles and comments time and again, day and night, to produce a flood of misinformation." In just one example of this relentless media onslaught, the affidavit shows that between November 27 2000, when the trial started, and July 8 2001, when the five were found guilty, the Miami Herald and El Nuevo Herald alone had published 1,111 articles on them - an average of more than five a day. "It was impossible to escape the permanent flow of propaganda anywhere in south Florida," Alarcon adds. "If all this were not enough, the 'journalists' also harassed witnesses and jurors. The latter complained to the judge that they were frightened because they were followed with cameras and microphones." Ironically, it was a journalist from one of the biggest offenders, the Miami Herald, who first exposed the illegal payments in 2006. This action was not without consequences for the reporter, Oscar Corral. Shortly after his article was published his editors were forced to move him and his family to a safe house after he was, in his own words, "subject to a campaign orchestrated to intimidate, harass and silence. It was heavy artillery fire. "Some threats were very specific and mentioned my family." But Corral's exposé was just the tip of the iceberg. Subsequent freedom of information requests have brought new names to light, but the full numbers are still unknown. The affidavit argues that the US government should release a complete list of payments and contracts, a request that has unsurprisingly been vehemently resisted so far. The names uncovered to date have dubious journalistic credentials to say the least. According to Alarcon, "all of them, without exception, were members of or had close links with organisations in Miami that cultivate violence and terrorism. Some of them are themselves convicted and confessed terrorists." Hundreds of thousands of dollars of US taxpayers' money paid for these people to write hate-fuelled propaganda about the five and Cuba before and during their trial. The US public was kept in the dark. Such secret propaganda is forbidden by the country's constitution and for this reason Alarcon stresses that the recent affidavit is of "exceptional importance - especially for true journalists, those who perform with honesty a profession some others corrupted and turned into an instrument to kidnap five innocent men." The affidavit concludes: "Every dollar for every article, image, radio or television show that was spent on this secret programme violated the integrity of the trial. "Every person who decided to pay, paid, took funds or covered up those payments in this secret programme violated the integrity of the trial." Alarcon notes that the media's role in the case of the Miami Five was the "great irony" of their predicament. "In Miami the media was a decisive tool to condemn them. Outside Miami, they are punished with silence." 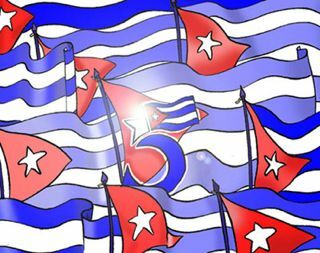 To help break this silence in Britain and mark the 14th anniversary of the arrest of the Miami Five, the Cuba Solidarity Campaign is organising a candle-lit vigil outside the US embassy in Grosvenor Square on Tuesday September 18 from 6pm. 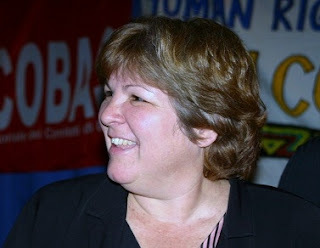 Aleida Guevara, daughter of Che, will speak alongside leaders from the British trade union and labour movement. Aleida will also speak on the Five as part of CSC's Remembering Che tour, which begins with a public meeting at the House of Commons on Monday September 17 at 7pm and goes on to Nottingham, Derby, Newcastle, Glasgow, and Oxford. Full details here. This article originally appeared in the Morning Star. 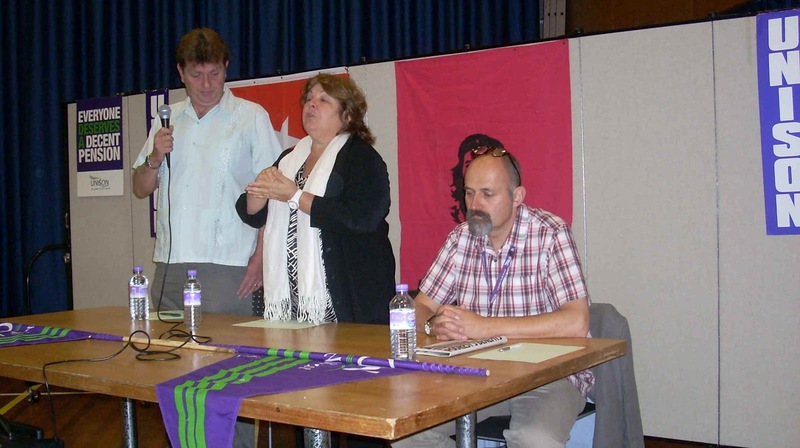 Aleida Guevara – daughter of Che Guevara – received a standing ovation after delivering a powerful speech against the US blockade of Cuba at a CSC fringe meeting at TUC conference on Monday. Over 250 delegates attended what Unite General Secretary Len McCluskey called “the biggest fringe meeting at the TUC” as Aleida spoke about a “blockade which marks everybody”. In his last TUC as General Secretary, Brendan Barber said he was “honoured to be the first TUC General Secretary to visit Cuba” and “proud of the links and relationships we have built up with trade unions in Cuba”. He urged the movement to intensify its support for the Miami Five on the fourteenth anniversary of their arrest. Click here for full details of Aleida Guevara's speaking tour. 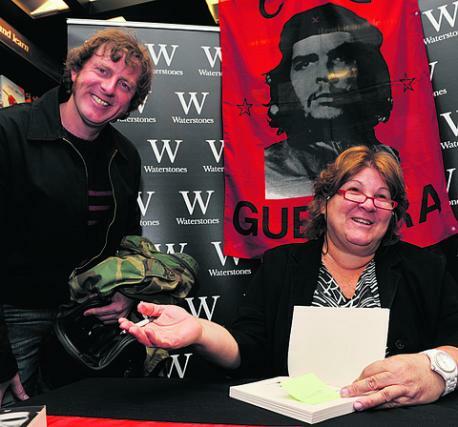 Preview of Aleida Guevara’s visit to Derby as part of ‘Remembering Che’ tour as appeared in the Derby Telegraph. 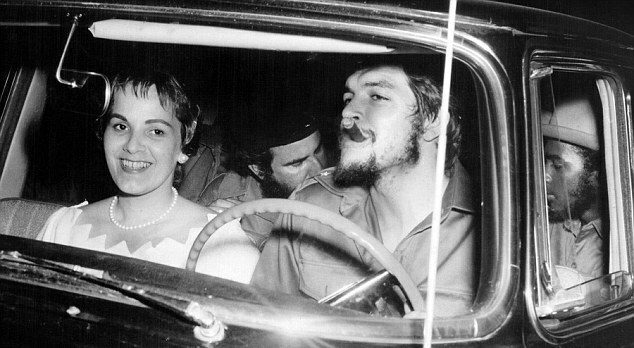 THE daughter of Cuban revolutionary Che Guevara is to visit Derby for the second time in three years. Dr Aleida Guevara works as a doctor of children's medicine and is taking part in a national workshop for health professionals in the city on September 11. She will be speaking about the role Cuban doctors perform working overseas. There are 20,000 doctors in more than 70 different countries worldwide. In 2009, she also took part in an international workshop on children's health and medicine at the then Derby City General Hospital and praised the NHS, describing it as "one of the best healthcare systems in the world". Imti Choonara, professor in child health at the University of Nottingham and based at Derbyshire Children's Hospital, said: "I am delighted that Aleida Guevara was happy to come to Derby again. "The university's academic division of child health has strong links with Cuba and has published joint research together looking at the side effects of medicines in children. It also has a bilateral agreement with the University of Havana and joint workshops are frequently held between the two universities." The following interview was written by Libby Brooks for the Guardian in 2009. 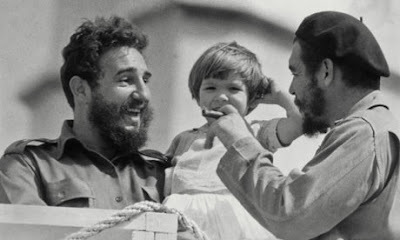 Aleida Guevara was four and a half when her father left Cuba. Ernesto "Che" Guevara, iconic Argentine guerrilla leader, Marxist theorist and second-in-command of the Cuban revolution, departed the island for Africa in 1965 after falling out of political favour with Fidel Castro. She saw him only once again, before his execution by the CIA-backed Bolivian government two years later. Castro granted the visit on condition that it was clandestine. Guevara, concerned that the children's chatter about "Papi's" re-appearance might endanger his family, arrived back in Havana heavily disguised. He was introduced at supper as a friend of their father. "After supper, I fell and hit my head," Aleida recalls. "He was a doctor, of course, so he treated me, but then he picked me up and cuddled me. I remember a feeling of complete protection and tenderness. Later I said to my mother, 'I believe that this man is in love with me.'" She laughs at her childish grandiloquence. "I was only five. But I knew that this man loved me in a very special way. I didn't know that it was my father, though, and he couldn't tell me." Aleida, now 49 and with two daughters of her own, has come to Britain as a guest of the Cuba Solidarity Campaign to promote a year-long festival of Cuban culture. A committed Marxist and medical doctor, just as her father was, the thick, bobbed hair, broad features and deep-set eyes are immediately reminiscent of the face without which no student common room is complete. "When I see [his face] commercialised, or used for advertising," Aleida intones sharply, "I don't like it." Ensconced in a functional committee room at Unison's north London headquarters, Aleida tugs a fine red shirt across her solid shoulders. She has inherited her father's charisma and mellifluous exposition, but exercises it more intimately. Talking about politics, she employs the language of emotion rather than that of arid ideology. Guevara's legacy, she tells me, is his life. "My father knew how to love, and that was the most beautiful feature of him – his capacity to love." She touches my arm. "To be a proper revolutionary, you have to be a romantic. His capacity to give himself to the cause of others was at the centre of his beliefs – if we could only follow his example, the world would be a much more beautiful place." So why is it that Cuba, an island that throughout its history has been coveted, bullied and demonised by mightier nations, continues to draw worldwide fascination? Her answer may seem simplistic, but it is instant: "Because of Cuban men and women. We're a cultured, educated people – and possibly one of the only ones in the world to say no to the United States." That "no", of course – regardless of whether it was dictated by an iron regime, as some would argue, or articulated by the populace – has manifested devastating consequences. The vicious embargo imposed on Cuba by the US the year after its revolution continues to suffocate the country. And as a practising paediatrician, Aleida is all too familiar with the daily realities of the blockade. "There was a case of a girl, six months old," she says. "She had a condition where the digestive system would flood with blood, and the only treatment available is patented by the US. Cuba had the money to pay, but not one company in the whole global medicine market would offer it." She presses together her thumb and forefinger in a gesture of frustration. "Any pharmacological distributor daring to deal with Cuba would be investigated by the FBI. The government can pull out investment or boycott their goods. We couldn't get the medicine and the baby was dying. The only sin of that girl was the fact that she was born in Cuba." There has been much speculation about how Barack Obama intends to alter US policy towards Cuba, following his announcement of "a new beginning" to their relationship at a recent Americas summit, and his easing of travel restrictions on Cuban Americans wishing to visit their homeland. Aleida is sceptical. "What Obama has done is to return to the policy that existed under the Clinton administration. There's nothing new here. He promised to close Guantánamo, but that hasn't been done. There is a lack of continuity between what he says and what he does. So far we haven't seen anything that would indicate a change of course. "If the blockade was lifted, things would change immeasurably. The Cuban economy would flower. That's the missing link." Coincidentally, in advance of Aleida's visit, the Cuba Solidarity Campaign has unearthed what are believed to be the earliest colour photographs of her father, taken by a British international brigade volunteer who travelled to the island in 1960, the summer before Aleida was born. The elderly woman unearthed her slides in a shoebox full of mementoes, never having realised the significance of the man she snapped on her colour camera. So how did Aleida feel when she first saw the photographs? "It was beautiful," she says. "The woman who took the photos actually worked in Cuba building a school. So even in the old days there were people giving their solidarity. That's the value of the photos to me." Her father looks like he always did, she says; natural and with people surrounding him. "I'm very grateful to this woman for giving me a piece of him that I knew existed but had never seen. But what I am most grateful for is that she remains in solidarity with Cuba." Her mother will be pleased to see them too, she adds. Aleida March was a member of Castro's guerrilla army when she met her future husband in the Cuban bush, and impressed him with her knowledge of the local terrain (Guevara was previously married to exiled Peruvian revolutionary Hilda Gadea). Now in her 70s, March has published a memoir about her life with Guevara, and how she raised their four children after his death. "You can buy it in any language you want except English," her daughter teases. "Do you read Turkish?" The ideals of both parents inevitably influenced Aleida's own consciousness, but you can't impose ideals on children, she cautions. "You can only show by example." It sounds far-fetched that a man intent on fomenting leftwing revolution in post-colonial Congo would find the time to make up animal stories for his faraway children, but Aleida says he did just that. "My father didn't have the opportunity to enjoy our childhoods. But when he was away, which was most of the time, he would send us stories and drawings on postcards. My brother Camilo was told off at nursery school for using swearwords, and my mother confronted Che because he had a habit of swearing – as all Argentinians do," she notes archly. "He was in Africa and he wrote to Camilo telling him that he couldn't swear at school, or Pépé the Caiman [a reptilian character invented by Guevara] would bite off Che's leg." She grabs my calf. "So he had to stop swearing to protect his father." Domestic as these reminiscences are, Che has, of course, never been solely Aleida's Papi or property. Alberto Korda's iconic portrait, taken at a funeral service in 1960 – jaw clenched, eyes to the horizon, unkempt locks under a red-star beret – has been reproduced on posters, T-shirts and advertising hoardings ever since. His image, if not his ideals, has entered the lexicons of adolescent rebellion and creative subversion. Last weekend, I spotted a teenager swinging a Che bag down Oxford Street and asked him why he'd bought it. Che was this cool guy who talked about revolution, he said. What revolution meant, he found harder to articulate. "When you see a child carrying his image on a march and the child says to you, 'I want to be like Che and fight until final victory', then you feel elated," Aleida says. "But the most surprising thing is that this event happened in Portugal, not in Cuba." But how does she feel about the use of his image in the El Commandante pub in Holloway, London, and the Che memorabilia crowding every proto-conscious market stall? She frowns. "I saw him used to advertise an optician's in Berlin. A fashion designer showed his underwear designs in New York reprinting his face." The thumb and forefinger connect once again. It all depends on the context. "But if a young person wears the T-shirt and starts to understand who this person was, then that's fine." Aleida is similarly ambivalent about Hollywood's recent obsession with her father. Walter Salles's Motorcycle Diaries, which traced Guevara's early, transformative travels throughout Latin America, was a magnificent film, she enthuses, that showed a young person learning about poverty and refusing to turn his back on it. The more recent two-part biopic Che, starring Benicio Del Toro, was disappointing. She had expected a more complete presentation of the revolution. The vocabulary of struggle, consciousness and sacrifice that Aleida uses may feel anachronistic to a British audience versed in the minor political narratives of personality conflict and fiddled expenses. But there is another story about Cuba, still to be told. As the west waits eagerly for further dispatches about Castro's failing health, for Aleida, his demise can only usher in a new beginning. "The US propaganda machine has dedicated itself to telling everybody that the revolution depends on just one person. But there is an inner conviction among the Cuban people. So, when the time comes when Fidel isn't with us physically any more, they will find a way forward. And if they can't do that, they will disappear. Pablo Milanés said once it is preferable to sink in the sea than to betray the glory that once lived. And for us that rings true."